These Gooseneck Landscape Lights have been adapted to use as walkway lighting and landscape lighting. This innovative adaptation of Lighting By Hammerworks gooseneck lighting is a simple yet elegant way to illuminate and enhance your landscape design. Consequently the side mount pole version,in addition to illuminating a driveway or walkway, can be used in a barbecue area or backyard deck. Of course as with all of Hammerworks handcrafted lights, our gooseneck sign lighting is completely handmade. Hence it allows endless possibilities and custom alterations for their use. 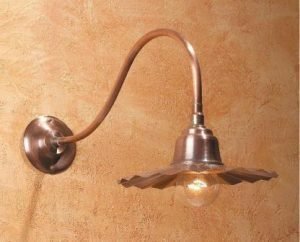 Furthermore while these Gooseneck lighting fixtures are intended for use as exterior fixtures, they can add a dramatic interior effect. Since we offer an option with a straight arm, it makes ideal task lighting. Consequently you can group them together over kitchen counters, islands, and even pool tables. Not only that create a dramatic statement with gooseneck lighting over a bathroom vanity. In addition restaurants often use them over salad bars or table booths. Thus from interior commercial applications to contemporary kitchens and beyond Gooseneck Sign Lighting provides a unique option for any lighting design scheme.